Play on your iPhone/iPod Touch! (Or in Safari, if you are so inclined. Now available as a desktop application! Just download, open the dmg, and copy DepthChage.app to your Applications folder. This game is heavily based on a board game of the same name by David E. Whitcher, of PyroMyth Games. All the programming and art, as well as the wording of these rules, came from me, Ross Andrews. I made it on a Macintosh using Dashcode by Apple (which, as I write this, hasn't been released), and The GIMP. 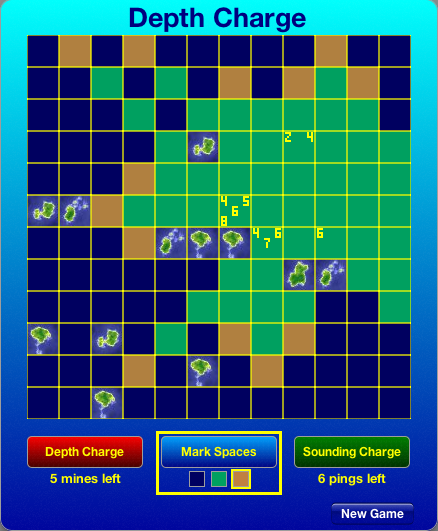 Depth Charge is somewhat like advanced Minesweeper. Instead of telling you how many mines you're near, the game tells you how far you are away from the remaining mines. The goal of the game is to blow up all five mines without missing more than twice, using no more than ten sonar pings to find them. Try to solve it using as few pings as possible! Use sounding charges to get information about where mines are, and deduce their location. You can use the marker to keep track of which spaces can't contain mines, and which are possible mines. When you've found one, use a depth charge to blow it up! Sounding charges return the distance to the mines you can hear. If a mine is on the same row, column, or diagonal as your ping, then the distance to it is the number of squares along that line. If it isn't, then either you're farther away from it horizontally, or vertically. Count along the farther way first, then the shorter way, so if you're two away horizontally and one away vertically, go across horizontally, then vertically, and add up the total distance. The distance to the top mine here is 2, and the bottom is 3 (two to the right and one up). If more than one mine is the same distance away, then only one echo is returned. So here, even though there are two mines two spaces away, only one "2" is returned by the sounding charge. The reason that it matters that you count the long way first is that some things can block echoes. If the path to a mine goes through an island, then you won't get anything for that mine from your sounding charge. Incidentally, if a sounding charge gets no echoes, then a yellow X is printed. Unexploded mines will also block sonar. The top mine in this example can't be seen, because it is blocked by the closer, two-away mine. The path to it has to go through that mine because you always take the longer side first. However, exploded mines don't block (or return) echoes, so once you blow up the closer mine you get an echo from the farther one. It's important to note that just depth charging the mine won't update the sounding charge, though; you have to make (and be charged for) another ping to see the second mine. The number will remain on your screen even after the mine is destroyed; you should mentally keep track of which pings were made when.